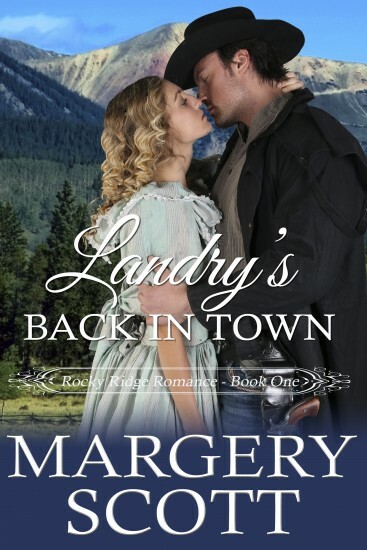 Landry’s Back in Town is the first book in the Rocky Ridge Romance series, a spinoff of The Morgans of Rocky Ridge. Landry Mitchell made a mistake coming home when he got out of prison. The residents of Rocky Ridge, Colorado arenâ€™t the forgive-and-forget type, so all he wants now is to be left alone. As a young child, Olivia Harding learned the hard way that approval only came from doing for others. Now, since she has no family of her own to love and care for, she spends her days at the town orphanage help to look after the children there. When Landry rescues Olivia from a dangerous situation, she sees a man who is lonely, a man who is hurt, a man who needs her whether he realizes it or not. As their feelings for each other grow, he starts to believe they might have a future together. Â Â Â Â Â The slurred voice startled Olivia Harding from her reverie. Her gaze darted around, noticing for the first time that she was completely alone. Late afternoon sun cast shadows on the deserted street, and a shaft of light already spilled from the doorway of The Lucky Shamrock Saloon a few buildings away. Â Â Â Â Â Sheâ€™d made the ten-minute walk between her house and the Rocky Ridge Childrenâ€™s Home countless times over the past few months without giving any thought to her surroundings. Â Â Â Â Â Until now. Â Â Â Â Â She couldnâ€™t see anyone, but she wasnâ€™t the kind of woman who let her imagination run wild. Someone was lurking in the shadows. Â Â Â Â Â Tendrils of fear snaked up her spine at the suggestive tone of the manâ€™s voice. Her heartbeat skittered in her chest, and a cold chill washed over her. Â Â Â Â Â Suddenly, a man appeared out of the shadows between two boarded-up buildings and stood directly in her path. Foul odors assaulted her nose – liquor, cigar smoke and perspiration. Â Â Â Â Â Dark hair hung in oily strings from beneath a stained hat hanging low over his bloodshot eyes. Â Â Â Â Â â€œExcuse me, sir,â€ she said, doing her best to keep her voice steady. She made a move to go around him. Â Â Â Â Â She could scream, she supposed. But who would hear her? Her cries for help would be drowned out by the voices and the music from piano in the saloon. Â Â Â Â Â She backed up a few steps, widening the gap between them. The man advanced. Â Â Â Â Â â€œDonâ€™t be like that, darlinâ€™,â€ he said, mirroring her moves while closing the gap between them to stand within a few inches of her. Â Â Â Â Â Panic threatened to overwhelm her, but she took in a deep calming breath. Surely the man wanted to rob her, nothing more. â€œIf itâ€™s money you want, take it.â€ She shoved her embroidered reticule into the manâ€™s chest. Â Â Â Â Â Moving much faster than she thought him capable of, he gripped her arm. She let out a shriek as he spun her around, wrapping his arm around her throat. Â Â Â Â Â Terror spiked her heart rate at the thought of what he was going to do to her. She kicked and twisted, trying to land a blow to his shin, but he held fast. She clawed at his arm, but it did no good. She felt herself being half-lifted, half-dragged into the shadows between the buildings. Â Â Â Â Â His arm tightened around her neck, cutting off her air. â€œItâ€™ll be a lot easier on you if you stop fighting,â€ he hissed. Dizziness washed over her. Her body weakened from the struggle to draw in a breath. Her lungs burned. Still, she couldnâ€™t give in. Some things were worse than dying. Â Â Â Â Â Suddenly, she heard him grunt. Her body jerked. Â Â Â Â Â Her attacker let out a guttural curse and a moment later, the pressure of his arm around her neck disappeared. Stumbling away from him, she reached out until she came into contact with the rough wood of one of the buildings. Â Â Â Â Â Gasping for air, she spun around and plastered herself against the wall as she peered into the darkness. Her eyes widened as she watched her attacker and another man grappling with each other. Fists connecting with flesh, neither man gaining an advantage until the stranger landed a punch to her attackerâ€™s face. Blood spurted from his nose, and she thought she heard a bone crack. Â Â Â Â Â Her attacker fell backward into the dirt. Kicking out, he hooked his foot around her rescuerâ€™s ankle and jerked, knocking him off balance. He crashed into a bin beside the wall and rolled to the ground as her attacker scrambled to his feet and raced away, disappearing around the corner onto the street. Â Â Â Â Â Olivia was shaking violently, while at the same time relief washed over her as her rescuer slowly got to his feet and limped toward her. Â Â Â Â Â She looked closely at him. Dark blue eyes, a strong, square chin, and a nose that appeared to have been broken once or twice. Broad shoulders and a narrow waist, and a gunbelt resting on lean hips. An aura of danger surrounded him, and for a moment she wondered if sheâ€™d been saved by someone who was a bigger threat than the one heâ€™d rescued her from. Â Â Â Â Â â€œOlivia Harding.â€ She held out her gloved hand, now covered with dirt and mud. Still, he took it in his, her small hand disappearing in his large work-roughened one. Even through the white satin fabric, his warmth seeped into her, chasing away the chill of what had almost happened. Â Â Â Â Â â€œNice to make your acquaintance, maâ€™am,â€ he said. Â Â Â Â Â â€œNothing to worry about. Iâ€™ve been hurt far worse than this.â€ He reached up and wiped the blood from his cheek with the back of his hand. Â Â Â Â Â â€œYouâ€™ll need to get Doc Leonard to stitch that up,â€ she said, moving a few steps closer and peering at the jagged wound. Â Â Â Â Â â€œPut your hands up, Mitchell.â€ The voice came from behind, startling Olivia. She spun around to see the sheriff, Zane Morgan, and his deputy, Emmett Farris, a few yards away. Â Â Â Â Â Emmett had his gun out of the holster and pointed at Landryâ€™s chest.